A partnership has developed over the past several years between the University of Rouen, the GRHis Research Lab of the University of Rouen, the Centre Iannis Xenakis and the Ecole nationale supérieure d'architecture de Normandie, as several conferences, exhibitions and concerts can attest. 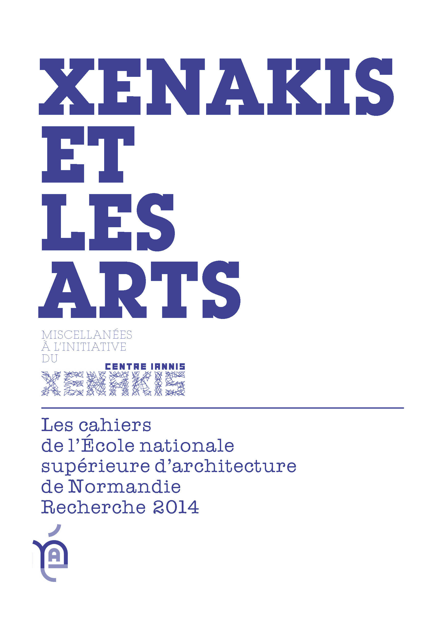 Therefore it seemed only natural for us to co-publish a frist collective work devoted to "Xenakis and the arts." Iannis Xenakis (1922-2001), the quintessential polymath, never - in fact - acted as a only musician or as only an architect. In fact, he fully played out his own model of "artist-conceptor", inspired both by science and the arts. In short, like the works and thinking of Iannis Xenakis, the philosophy of this book invites a permanent forum. Having at heart to speak to the careful reading of multiple materials bequeathed to CIX (articles, drawings, correspondence, scores, tapes, photographs, discography, video recordings ...), this is exercised de facto through the interdisciplinary plurality of his own original ideas.